We are a family owned 480 acre dairy & stud farm abundant game & birdlife, carpeted in acacia trees. Only one and a half hours from Nairobi. 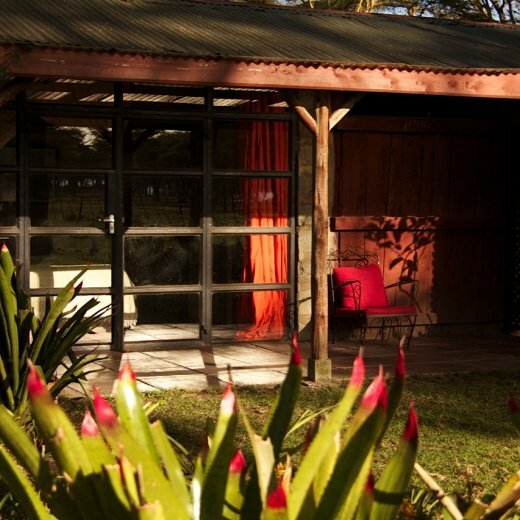 This is a beautifully designed, contemporary room converted from a stable yard with its own bathroom & verandah overlooking acacia forest abundant game on the shores of Lake Naivasha. All meals take place at The Club House Cafe where we cook the produce from our garden brimming with vegetables, herbs & fruit. We have a set menu for lunch and dinner. Our lunches are healthy with either a light fish or chicken dish and an array of exciting salads. Dinner is a more elaborate candlelit affair. The Farm is a natural paradise, a place to relax amidst the wildlife and get away from the hustle and bustle of city life. Sanctuary Farm is a family run dairy & horse stud farm, abundant game situated in Lake Naivasha, 95km from Nairobi. A place where one can be as social or as private as one wants to be. It is a perfect place to ride, walk and cycle in a safe private environment, whilst enjoying the numerous species of wildlife and world class birdlife. Sanctuary Farm's old stable yard has been been converted into 10 double rooms each with their own bathroom and verandah nestled in an acacia forest. Five of the rooms are quite small and the other five much more spacious with extra beds for families. The bathrooms, verandah and gardens overlook the farm, all its birdlife and wildlife grazing in the fields beyond, all rooms have wi-fi. The campsite is set in a forest of indigenous yellow fever trees. A very private, natural campsite, where you can camp alone or with the friends and family you choose to be with. The campsite provides four luxury spacious bathrooms each with a hot shower, basin & lavatory. Wood for your campfire can be delivered for a small charge. 'The Club House' cafe offers exciting healthy fresh food in an old restored polo club house overlooking an old polo ground littered with zebra, wildebeest, giraffe & impala and the lake beyond. There is a fully equipped bar. Sanctuary Farm approach to food is to keep it simple, fresh & creative made as much as possible from local produce. Breakfasts include fresh fruit & juice, yoghurt, cereals, eggs from, grilled tomatoes, sausages or bacon followed by a selection of homemade breads and our own preserves. A simple lunch is offered with a selection of exciting salads, a light fish, chicken or vegetarian dish, locally made cheeses and biscuits followed by a choice of homemade ice creams, sorbets. Dinner is a more elaborate candlelit affair in the cosy dining room preceded by aperitifs around the fire. Meals could not be more civilized with a carefully chosen menu and a selection of imported and local wines. It was absolutely fantastic. The food, service and all were really good. Already recommending it to colleagues and will definitely be coming back. We had an awesome stay. Certainly no complaints. Simply a wonderful time leaving you with the desire to stay far much longer than you intended! It goes beyond your expectations. Julie is so kind and so attentive as are all her staff. Very romantic!!! Great food!!! Harriet the pig is adorable and hilarious to observe. It was a blessing to have found this space and place and all the rooms are lovely!!! Enjoy the animals grazing by your room's door. Enchanting!! My country is simply BEAUTIFUL!!! Sanctuary Farm offers you a very lovely slice of its paradise. Definitely going back! Cannot recommend it enough!!! Room Tip: All the rooms are great! Cosy, beautifully decorated, great water pressure. Simply lovely! Everything was great and very easy. The food is amazing. It is absolutely phenomenally good actually. Perfect place for foodies. Host is very nice. Location is beautiful and very peaceful. We can only love it. Felix, Nathalie, Jack Daniels - you were all great hosts!!! Amazing place, amazing horses, amazing number of animals - we can only love it! The visit to Sanctuary Farm was great thank you - a lovely place, amazing food and great hosts.